FaveQuilts has put together its very first free eBook of free quilt patterns! The 12 Awesome Free Quilt Patterns and Small Quilted Projects eBook has over 50 pages filled with applique quilt patterns, patchwork quilts, and small quilted projects. Whether you're a novice quilter or you have years of experience, you're sure to find some free quilt projects that will keep your sewing machine humming! 12 Awesome Free Quilt Patterns and Small Quilted Projects is absolutely free to FaveQuilts readers. Simply click on any of the links below to download the eBook as a PDF. You can then save the eBook to your desktop or print it out for easy reference while you are quilting. With this downloadable eBook, you'll have all 12 free quilt patterns at your fingertips any time you want to start quilting! If you've never tried making a quilt before, now is the time to start! 12 Awesome Free Quilt Patterns and Small Quilted Projects is full of simple quilt patterns to introduce you to the fun of quilting! The free quilting patterns in this eBook will inspire you to start creating so that you can make patchwork quilts, applique quilts, and other small quilted projects like the ones you see here on FaveQuilts.com. Download your copy of 12 Awesome Free Quilt Patterns and Small Quilted Projects today! Want more free quilting patterns and eBooks? Check out all of our free quilting eBooks! 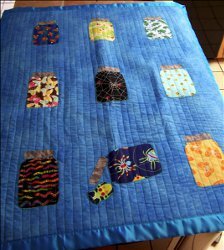 Start small with some applique quilt designs from 12 Awesome Free Quilt Patterns and Small Quilted Projects, like the "Bug Jar Quilt" (p. 12). Using this tutorial, you can learn how to make any applique quilt patterns that involve fusible applique. It will also familiarize new quilters with basting, maching quilting, and binding applique quilts. Applique quilt patterns are great for quilters who enjoy quilting and working with fabric but don't like piecing. Allow your creativity to shine with applique quilt patterns that let you cut out whimsical shapes and arrange them on a fabric background in a way that's aesthetically pleasing. You can design something such as floral applique quilt patterns for bedrooms and girls' rooms with the "Darling Daisies Applique Quilt" (p. 20). These applique patterns for daisy petals and centers can help you make this beautiful quilt at home! There are also seasonal free quilt projects like the "Autumn Applique Wall Hanging" (p. 18), which uses fall leaves, acorn, and pumpkin applique patterns to embellish this decorative autumn quilt. The long, skinny quilt is the perfect size for a wall hanging, but you could also use it as a fall table runner! When you're ready to try some small quilted projects that are a bit more complex, try the "Crow on Berry Branch Applique" (p. 5), a detailed tutorial on making a block for applique quilts. The tutorial outlines the freezer paper applique method with step-by-step photos. You can use these free applique patterns to create a simple wall hanging or blocks for larger applique quilts. If you've never done piecework before, try starting off with one of our small quilted projects. 12 Awesome Free Quilt Patterns and Small Quilted Projects offers a nice selection of items to choose from. These free quilt patterns take just a day or two to complete and can easily be made with leftover fabric from other projects. Decorating your home with small quilted projects is a great way to show off your quilting skills and save money on interior design as well! Start with the "How to Make a Patchwork Pillow" (p. 45), which demonstrates the basics of piecing fabric squares, pressing seams properly, and matching up corners. Update your home decor without ever having to step foot into another overpriced store by making these table toppers and table runner quilt patterns. 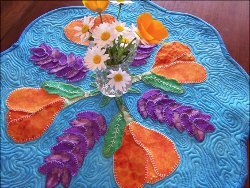 The "Spring Table Topper" (p. 36) tutorial includes beautiful applique patterns for poppies and lupines that dress up this simple table topper into something spectacular! Make this quilt to usher in spring or celebrate summer. For something more modern, try the "Zigzag Table Runner" (p. 34) for a geometric table decoration. Choose three fabrics that coordinate with your kitchen or dining room colors to make the zigzag table runner! Want to challenge yourself with free quilt patterns that are even smaller? There's the lovely "Baby Bird Quilted Wall Art" (p. 49) project, which is an adorable gift to make for an expectant mother or the new baby in your life. The small quilted and framed circle of fabric showcases bird and branch applique patterns and the baby's name appliqued and outlined in embroidery. Download 12 Awesome Free Quilt Patterns and Small Quilted Projects for free today! For quilters who are intrigued by the geometric patterns of piecework, we have included several patchwork quilt patterns in 12 Awesome Free Quilt Patterns and Small Quilted Projects. Whether you use a fabric cutter to make cutting go quickly or trim each piece of fabric by hand, you'll enjoy watching as the small pieces of fabric combine to create amazing piecework patterns! If you're new to piecework, start out with the Concentric Diamonds Patchwork Quilt. Its simple rows of diamonds are easy to piece, and the final effect is stunning! Patchwork quilts made from this pattern display a large variety of fabrics with an impressive overall effect. The entire pattern is made by sewing diamonds into diagonal rows, which are then pieced from corner to corner to make the quilt top. If you're a more experienced quilter ready for the challenge of curved piecing, try the "Four Color Apple Core Throw" (p. 31). The simple repetitive pattern will help you to familiarize yourself with matching, sewing, and clipping curved seams. The apple core pattern is one of the most traditional of our free quilt patterns. This simple quilt with curved seams takes on an understated charm in the four varying shades of blue and gray. Apple core patchwork quilts make beautiful throws for the living room or bedroom. A true beauty is the "Glorious Garden Floral Quilt" (p. 27). This free quilt pattern is commonly known as an ocean waves pattern, but Glorious Garden is the perfect name for this full size quilt made with floral fabrics. Decorate your room with a "bed" of flowers! Luxury fabric will create a lush effect that's going to make this one of the most amazing flower quilt patterns you've ever seen. The size fits a bed quilt perfectly, so you can appreciate your hard work every single day. Four weekly e-mails with free quilt patterns, tips, collection pages, videos and more. Chances to win quilting books and products in giveaways and contests. Access to our free pattern library full of hundreds of free quilt patterns. The opportunity to share ideas and help others in the quilting community. Don't miss out on all these free quilt patterns! This eBook is provided to our readers at no cost, so you can print out the patterns and make beautiful quilted projects without breaking your quilting budget! Our applique quilt patterns also include free printable applique patterns so that you can copy and cut out as many applique templates as you need. Once you have downloaded the eBook and subscribed to our Piecing It Together newsletter, you will receive new free quilt patterns in your e-mail inbox every week! Join the FaveQuilts.com quilting community and gain access to hundreds of free quilt patterns and connect with quilters all over the country. Download this free eBook and check out FaveQuilts.com for tons of quilting inspiration! This is wonderful and maybe you can help me find the sewing machine cover that I seen the other day. I tried to make one and something is wrong with the curver and corners. Hi, memapam! Unfortunately, we can't have email addresses displayed in these comments sections (we're trying to protect you from spam and scammers!) but I would suggest posting this question on our Facebook wall. That way anyone who knows where to find the Royal Star of Oregon can contact you. If you're interested, we also have this royal star quilt here on FaveQuilts: http://www.favequilts.com/Throws-and-Lap-Quilts/Ro == yal-Star-Quilt Best of luck! I WOULD LIKE A PATTERN FOR A CHEVERON QUILT USING 2 SQUARES ON TOP OF EACH OTHER. SEWING ALL AROUND THE 4 EDGES AND THEN CUTTING CORNER TO CORNER ON THE DIAGONAL. I am very happy that you offer free patterns. I love to quilt and I have not come up with the knack of making my own patterns. I m sure some day it will come to me but as of yet I need to follow a pattern. lol. thanks again. from a quilter. Love these saw 3 I will make for sure! Thank you very much! All fun! Love getting something for free .... love these patterns! i am looking for the pattern called ELECTRIFIED FANS. Can you help me? You had a Dresden Plate review. An It was a large pattern, the quilt was like 90" across. But I can't find a Dresden Plate pattern for the petal that big. Can you help me. If you already have a Dresden ruler/template, such as the one by Darlene Zimmerman which in only 8" tall, all you have to do is place a ruler on both sides of the edge and add as many inches as you'd like. I did it on paper first, then made it with vinyl template "paper". No need to spend tons of cash for one huge one. Hope this helps. I love the dresden's myself; have make almost 40 already. Do you have a pattern for making a quilt with mens ties? Again, this is where Dresden plate blades or petals as some call them come in handy. Everytime someone in my family sees the individual blades, they ask me, "Why are you making a quilt entirely out of mens ties?" I'm talking about the pointed ones, not the ones with the rounded tops. But if you meant actual men's ties, then I don't know of any. But the Dresden blades/petals, when done properly, look like little ties. Happy sewing! There is a pattern called Daddy's Ties. It shows how to make a wall hanging from men's ties. I made one that ended up being 40" x 50". You could make this into a quilt by making the size you want, then putting the ties in the middle. The short end of the ties can be used in the corners. It is very pretty! And just what are you expecting for free? There are patterns that you have to pay for that are less impressive than these free patterns. I am looking for a dutch boy quilt pattern for my mom. Any suggestions where it can be located? Thank you very much for the free step by step instructions, templates and patterns. I already know what fabric I'll be using for the diamond quilt. 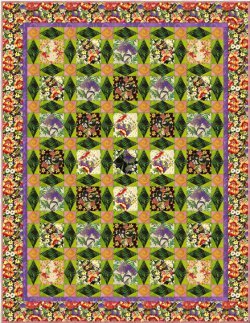 I love the free download of 12 Awesome quilt patterns but for the autumn wall hanging, where are the leaves and pumpkins templates? They are missing. Can you tell me where to download them from..I love that one and want to make that one! Thank you very much. where are the videos, I want to make a pillow? thank you so much!! i love this site and will be referring back to it often. thank you very much for the free books. love you videos as well, that's how i got to your site!! keep up the good work! I love this site but I have to say something about one of your free pattern books. I would really like to make one of the table runners from the free Quilt Patterns book however, the pattern calls for a Starmaker 8 ruler. I don't know about anyone else, but I CAN'T AFFORD TO PUT OUT $24.00 FOR A "SPECIAL" RULER JUST TO MAKE A TABLE RUNNER.... so much for "free" patterns. Does anyone have any suggestions as to what else can be used? Although I am new, and just getting started here, I think the patterns are pretty and the tutorials are very informative and easy to understand. please keep the quilt patterns coming. Many thanks!!!!!!!! I think the site is great! Anixous to be a part of it and get new ideas and patterns.